I think I could get used to this kind of life. 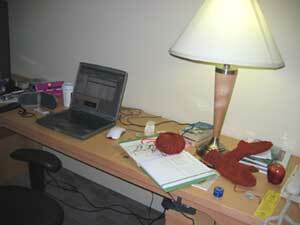 You get up when you feel like it, wander around for a bit, write a bit…knit a pair of mittens. It’s a strange kind of environment up here. Nothing is quite real, because you know that very few people actually get to live like this all the time. Nevertheless, it’s a nice way to spend some vacation time. Egads…the weather forecast for Friday is calling for snow. Let’s hope higher elevations are really, really high up…!